I have several aprons that have been given to me. This one was given to my parents when they were married from my Great Great Grandma (who had to be close to 90). She made it and embroidered the pattern at the bottom by hand. I don't think I realized when I was younger where it came from. 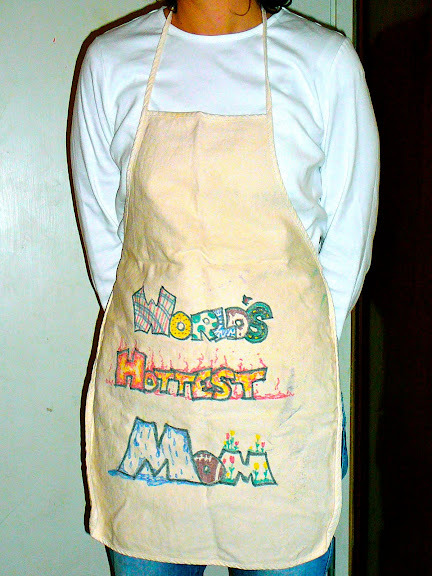 I do remember that anytime I was in the kitchen, this was my favorite apron to wear. I always felt girly in it. I was excited when my mom gave it to me, especially now that I know where it came from. One of the first aprons I received as a gift was from my husband. I was pregnant with my 1st child and he made me this for Christmas. I now use it to wear for the haircuts I give my boys. It's covered in hair and exudes love. Little did he know, but my husband started an obsession. I had a lot of fun making these. The four ingredients are snickerdoodles, zucchini bread, peppermint bark, and pretzel turtles. Here's the recipes. In another bowl, combine flour, salt, and baking soda. Pour the dry ingredients into the wet ingredients and mix well. Preheat oven to 300 degrees and let the dough rest for 30-60 minutes in the refrigerator. In a small bowl, combine sugar and cinnamon. Take about 2 tablespoons dough and roll into a ball. Roll in cinnamon and sugar mixture and place on ungreased cookie sheet. Bake the cookies for 12-14 minutes and NO MORE. Allow cookies to cool on pan for 2 minutes before removing to cooling rack. The cookies may seem undercooked, but will continue to develop after they are removed from oven. I've had this apron finished for over a month now and I'm finally showing everyone. 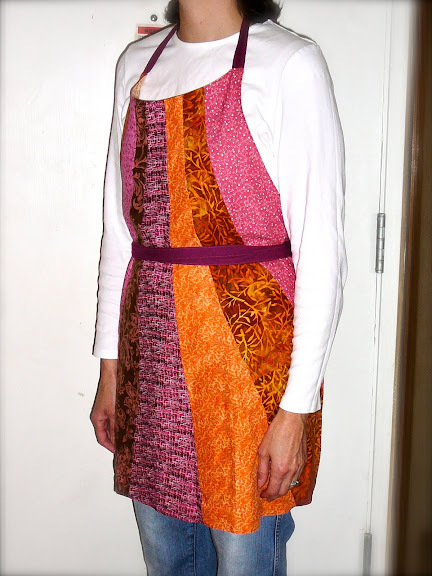 It was a fun pattern to make but definitely needs some tweaking, as a first apron usually does. The pattern on the backside of the apron was done with double-sided fabric adhesive. I used a thick one, thinking that then I wouldn't have to stitch around the design. Wrong. I still had to. Next time I will use a thinner and more flexible adhesive since I have to stitch around it anyway. It's kind-of stiff on the apron, but it's cute enough to make up for it. 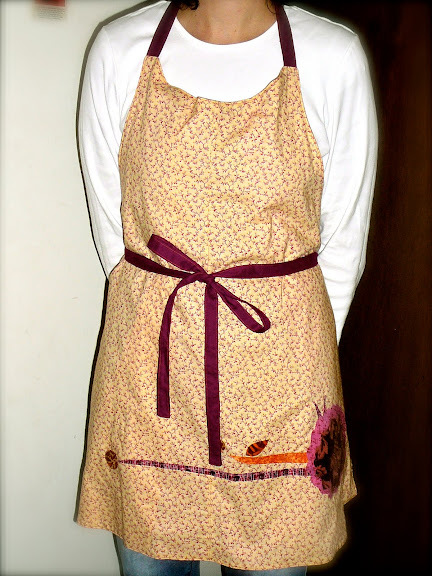 One of the things I loved about this apron is that there are so many different pieces of fabric. It really could use up scraps you have lying around.